Metal detectors are used in a wide range of applications from landmine detection to safety in airports, office buildings or schools. They can also be useful around the house to help locate lost coins, jewelry, keys and gas lines. Metal detectors helped archaeologists in the discovey of precious artifacts and coins that were once the everyday items of use by our ancestors. Until recently, this privilege was reserved for the lucky few who could afford the expensive instrument. But with the advances in electronics and technology the price of these machines dropped to an affordable level. Today, inexpensive, high quality consumer-oriented metal detectors provide millions of hobbyists around the world with an opportunity to discover hidden treasures, providing relaxation, excitement, the thrill of discovery and why not - profit. 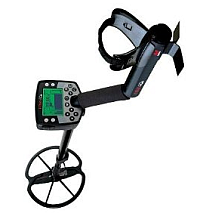 As you start your search for the perfect metal detector, you will quickly discover that there are a multitude of detectors from which to choose from. There are machines using different technologies such as BFO (Beat Frequency Oscillator), Off-Resonance, IB (Induction Balance), VLF (Very Low Frequency), VLF/TR, TR (Transmit-Receive), PI (Pulse Induction), or RF (Radio-Frequency or Two-box detectors). Innovations in the field of metal detecting are a still going on -- there are new patents and original designs born every day. Very Low Frequency (VLF) detectors are the most versatile metal detector types, based on the range of metallic objects you can find with them. They are IB (Induction Balance) detectors using very low frequencies. As all IB designs, the VLF detector combines two balanced coils: the outer coil acts as a transmitter, using alternating current to create a magnetic field that is distorted by a metallic object and the inner coil acting as a receiver, reading the secondary magnetic field created by the conductive object. This magnetic field is amplified and converted to an audio tone. The phase demodulators help to discriminate among types of objects. Pulse Induction (PI) metal detectors are sending repeated pulses of electrical current to the search coil, producing a magnetic field. The coil transmits a pulse toward the ground, generating an answering pulse from the target object. A sampling circuit measures the pulse and sends it to an integrator, which generates an audio tone. PI outperforms the VLF/TR in areas where little trash is located, on saltwater beaches or mineralized ground, since they are capable of ignoring both conductive salts and mineralization simultaneously. Pulse Induction detectors are able to detect objects buried deep underground, but they are sensitive to iron and do not have the ability to discriminate against different types of metals. This flaw makes their use on inland sites extremely difficult. The Beat-frequency oscillator (BFO) is the simplest (and oldest) type of metal detector technology and is a good starting point for learning how metal detectors work. The basic beat-frequency metal detector employs two radio frequency oscillators which are tuned near the same frequency. The first is called the search oscillator and the other is called the reference oscillator. The outputs of the two oscillators are fed into a mixer which produces a signal that contains the sum and difference frequency components. This signal is feed to a low-pass filter removing the harmonics. As long as the two oscillators are tuned to the same frequency, the output will have no signal. When a metallic object disturbs the magnetic field of the search coil, the frequency of the search oscillator shifts slightly and the detector will produce a signal in the audio frequency range. Although once popular, BFO's are no longer being made by professional metal detector manufacturers. They are simple and inexpensive, but do not offer the accuracy and control of modern PI or VLF detectors. Attempts have been made to add new features such as discrimination and more advanced models were produced in the 1970s, but they were soon replaced by recent, more sophisticated technology. BFO designs are still used in cheap hand-held devices and in low quality, toy type detectors. The vintage BFO detector is more of a curiosity and collector's item than a usable piece of equipment.